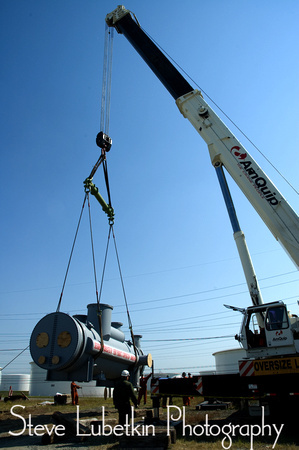 Hainesport, New Jersey, USA – Thursday September 13, 2012: A 115,000-pound industrial heat exchanger unit, fabricated by Perry Products of Hainesport, NJ, makes its way to its final destination at the Delaware City Refinery in Delaware City, DE. The shipment is pictured approaching the Delaware Memorial Bridge. We’ve just completed an industrial photography assignment for Perry Products, Hainesport, Burlington County, NJ. The producer of high quality shell and heat tube exchangers for industrial processes just fabricated its largest heat exchanger ever, a 115,000-pound unit built for the Delaware City Refinery Corporation in Delaware City, DE. We photographed the unit as final preparations were made for its road shipment on a specialized flatbed tractor trailer. We made still and video images of the component being loaded on the flatbed, followed it across the Delaware Memorial Bridge, and on into the refinery where it was offloaded for installation in the refinery’s processing area. Hainesport, New Jersey, USA – Thursday September 13, 2012: An industrial exchanger unit fabricated by Perry Products of Hainesport, NJ, weighing 115,000 pounds hangs from a crane while workers prepare wood blocks as a resting spot at the Delaware City Refinery in Delaware City, DE. We have a long track record of industrial photography, and we’d be pleased to help you make dramatic, high-impact images of your corporate activities. You can see these images and other examples of our industrial photography on our photography site. Check back for a video documentary of this shipment, which will be available shortly.